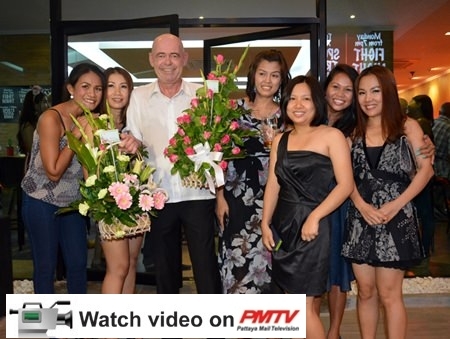 Stewart ‘Froggy” Fraser is a man who is synonymous with service & hospitality as he has been the landlord of some the best known pubs in Pattaya for many years. On Tuesday the 27th of May hundreds of loyal customers and friends attended the opening night of his latest venture: Fraser’s. Fraser’s Aussie roots were clearly evident in the design and layout of the spacious bar & restaurant, which is situated within the cluster of some of Pattaya’s popular restaurants at Château Dale on Thappraya Road. Stewart ‘Froggy” Fraser (center) celebrates the opening of his new venture, Fraser’s Pub on Thappraya Road. Froggy stated that the emphasis would be to cater for his loyal following but with a distinct flavour, especially in the kitchen where his chefs would be serving up classic Australian fare, simple, tasty and cheap. Fraser’s Pub also features a variety of draught beers and the comfortable seating makes it’s an ideal place to grab a snack, washed down with a cool drink, chat with your friends or watch the sports including the up-coming world cup on the numerous widescreen televisions. Fraser’s is open from 8 a.m. until late, seven days a week.